Why Future of God Amen? 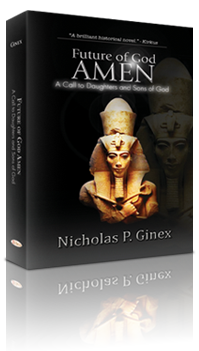 ► Inform people that the soul, truth, justice, righteousness, a hereafter, the God Amen , and Son of God, were developed by the religion of Ancient Egypt. ► Motivate religious leaders of the Judaic, Christian, and Islamic religions to accept Amen as a common bond to work together for religious unity. ► Energize religious leaders to eliminate separatism between their religions and prevent the loss of belief in God by a more discerning people. ► Emphasize religious leaders are required to teach our sisters and brothers, from every nation, to love and support one another. ► Initiate a Council for Religious Unity to provide a forum for Judaic, Christian, and Islamic religious leaders to unify their beliefs with the assistance of Daughters and Sons of God. ► Base religious beliefs with truth about their beginnings so that faith and science will advance on a parallel path in the quest to know God. ► Encourage religious leaders preserve the spiritual nature of mankind. A silent position will continue bigotry, hatred, violence, and invite terrorism that threatens the very survival of human life and indeed, our planet.